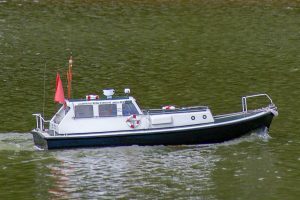 Pilot Boat ” Vandyke” with two superstructures .. one as the Nelson 42 Pilot Boat (see above) and an another rigged as the Lulworth Range Safety Boat. I have recently converted the power unit to two Decaperm motors with separate Electronize speed controlers to give good performance. Indeed over several years the craft has been reconditioned three times always improving the performance. As it is a heavy/bulky craft I think that I must let her go too but only with a sensible offer above £195 please. Oh and yes! 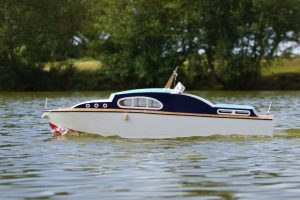 the hull was built on fibre glass by a professional boat builder from the big boys market – a really strong model (more photos). Length: 100 cms. Beam:30 cms. Draught abt. 10cms. 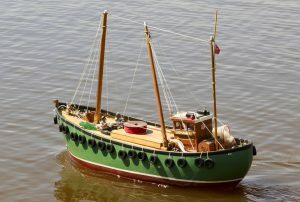 Seafarer of Poole is a classic Cabin Cruiser model rebuilt by Roger Yeatman. It is similar in style to the AeroKits “Sea Commander” model.